No one would be surprised, I don't think, that my family loves canned peaches. I can a whole bunch of them myself in jars each summer when they're ripe and juicy. Heck, I wrote a book about it! Trouble is, those jars of home-canned peaches run out somewhere around mid-winter and yet we still want the taste of pure summer in our cakes, pancakes and pies. That's when I reach for canned peaches from the shops. They're handy, affordable and, best of all, they pack a peachy punch just like homemade. In Canada, canned peaches are almost exclusively California cling peaches, which are sliced and canned within 24 hours of coming off the tree to preserve their flavour, texture and nutritional content. They hold their shape nicely too, which makes them ideal for slicing and dicing to suit whatever you're making. My first instinct when developing a recipe using canned peaches was to do something sweet. But, loving a good challenge, I decided instead to aim for something a little less obvious. 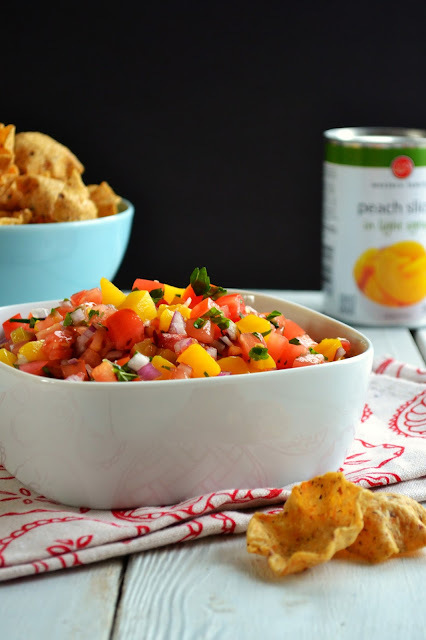 To honour their summer flavour, I settled on a salsa recipe using tomatoes, fresh mint, and the canned peaches for their gentle, sunny sweetness. 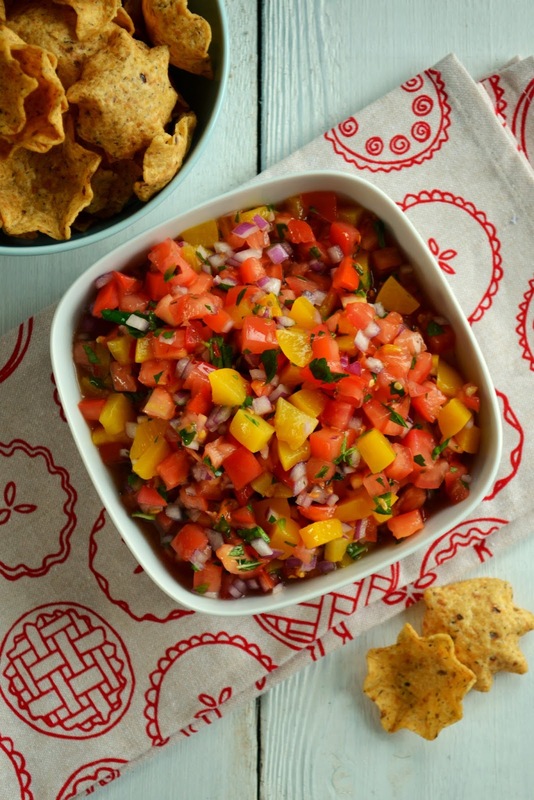 With a little hot chili flakes and the juice of a lime stirred in, the result is a fresh and fruity salsa. Try it at party time with crunch tortilla chips or use a few spoonfuls to dress up baked chicken and fish. 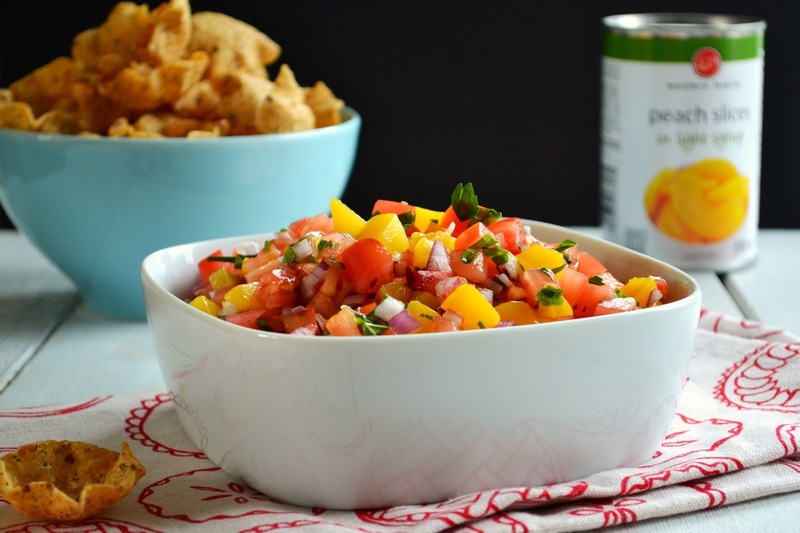 In a medium bowl, mix together the peaches, tomatoes, onion, mint, lime juice, chili flakes and salt. Serve right away or cover and refrigerate until ready to serve. How do you like to use canned peaches? Leave a comment and share your peachy ideas! Disclosure: I am being paid my standard recipe writing fee for developing this recipe using California Cling Peaches. Views are my own.